This is a typical fixed lens 35mm rangefinder from the 1970s, but with a body on the large side. The lens is a fixed Yashinon 45/2.8 which focuses from about 1m to infinity and takes 55mm filters. The aperture priority exposure system is measured by a CdS meter above the lens. CdS metering requires batteries. Two LEDs on the top of the body indicate slow speed and over-exposure. The camera was available with either a black or chrome body. 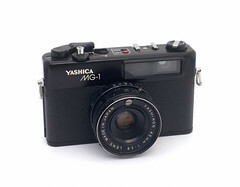 http://www.orphancameras.com Orphancameras site has full manual for MG-1 and many other Yashica cameras on it's site, alphabetical listing.